A CBS News Survey in 2014 found that 3 in 4 Americans believe in an afterlife. A similar survey in the UK in 2009 found 1 in 2 believe in life after death and 70% believe in the existence of a human soul. 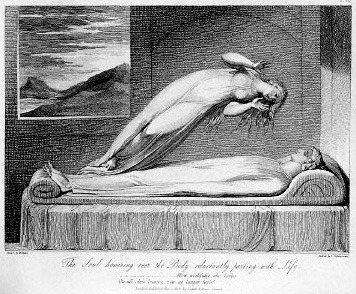 So pervasive is this belief that, amazingly, more Britons believe in life after death than believe in God! This belief in life-after-death is so fundamental to how humans see the world that a 2013 Pew Poll of Americans found that 13% of athiests also believed in an afterlife! Of course, many will argue that once you are gone you are gone, but in that twilight moment in the minutes and seconds before death, people have been revived through heroic medical interventions and some but not all declare they have experienced ‘something’ absolutely remarkable. Called Near Death Experiences, entire shelves of books have been written on this subject over the decades since the ground-breaking work of Ceila Green in 1968 and then popularized in 1975 by psychiatrist Raymond Moody. Extensive eye-witness accounts were recorded, classified and sorted into a small number of apparently archetypical scenarios such as tunnels of pure light; out of body experiences; meeting loved ones; indescribable love. According to a Gallup Poll about 3% of Americans claim to have had them. There were early attempts by Duncan MacDougall in 1901 at detecting the exit of the soul from the body by carefully weighing the patient, but all failed, and were immediately explained by denying that the soul had any weight at all. Scientists have largely refused to wade into this area of inquiry because, like many other human beliefs, there is enormous public resistance to scientists meddling in such cherished and highly personal ideas shared by virtually all humans, even some athiests! In a classic case of what psychologists call confirmation bias, there is nothing that science can say about this matter that would be trusted unless it lines up exactly to confirm what we have all made up our minds about, literally for millennia. That said, I myself, must tread very carefully as I write this blog because, frankly, those of you reading it have also made up your mind about the subject and I do not want to slap you in the face by disrespecting your fundamental core beliefs, which will always trump anything a scientist can tell you. Even my simple uttering of this disclaimer will be interpreted as me being a condescending scientist…or worse! But I cannot help myself! I have been curious about this subject all my life, and any new insights I come across in my readings are like candy to my brain. So here goes! NDEs are not a feature of any other organ than the brain because they involve visual perceptions, bodily sensations, and the knitting together of a story that is later told by the ‘traveler’. All of these are brain functions, so it is no wonder that those who study the clinical aspects of NDEs begin with what the brain is doing. Amazingly, you do not even have to be clinically ‘near death’ to experience them. All that is required is a deep conviction that you ARE dying to trigger them. What could be a more compelling and simple idea than putting a dying person in a functional magnetic resonance imager (fMRI) or strapping an EEG net to their heads, and literally watching what the brain is doing during one of these events? Well, it would be a heinous experiment and an unwelcomed intrusion on a patient’s privacy, but nevertheless these things do happen accidentally. Cardiac patients who are more likely to die suddenly and be recovered are often monitored for other reasons prior to their NDE, and there are many other indirect ways to snoop on the brain to see what happens too. We have already learned from fMRI studies that there is a specific brain region that allows you to have a sense of where your body is located in space. In an earlier blog I discussed how removing the stimulation of this normally very active region causes meditators to have the sensation of being ‘at-one’ with the universe. This state can also be reproduced at will through chemical manipulation. The region, when stimulated with an electrode, or during temporal lobe epilepsy, also produces the aura sensation that your Self is no longer anchored to your body in space during so-called Out-of-Body (OBE) events. So, an essential element of your body sense during an NDE can be traced to one specific brain region and whether it’s activity is stimulated or depressed. This region wins both ways because when its electrical activity is gone, you have one ‘cosmic’ sensation of leaving your body, and when it is over-stimulated you have the OBE sensation. As we know, death is the ultimate event that lowers brain activity, or temporarily elevates it in other places as blood flow catastrophically changes. We all have the same brains, so the real question is, why is it that EVERYONE doesn’t have a NDE? It all seems to depend on how close you get to the precipice of never returning from the journey, and it is the closeness of your brain to this physiological edge that seems to trigger the events leading to this NDE experience. But we do not know for certain. A 2011 Scientific American article summarized some of these elements announced by brain researchers Dean Mobbs and Caroline Watt. OBE experiences can be artificially triggered by stimulating the right temporoparietal junction in the brain. Patients with Cotard or “walking corpse” syndrome believe they are dead. This is a condition caused by trauma to the parietal cortex and the prefrontal cortex. Parkinson’s disease patients have reported visions of ghosts. This condition involves abnormal functioning of dopamine, a neurotransmitter that can sometimes but not all the time evoke hallucinations. The common experience of reliving moments from one’s life can be tied to a neural circuit involving the locus coeruleus, which releases noradrenaline during stress and trauma. 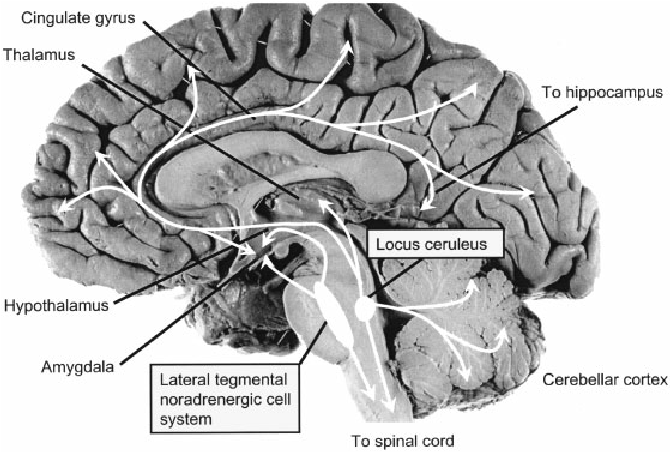 The locus coeruleus (shown below) is connected to brain regions that are involved with emotion and memory, such as the amygdala and hypothalamus. Finally, a number of medicinal and recreational drugs can mirror the euphoria often felt during NDEs, such as the anesthetic ketamine, which can trigger out-of-body experiences and hallucinations. These discussions of the neural basis for many of the separate elements to NBEs are now part of the official medical explanation in places such as the one found in Tim Newman’s 2016 article in Medical News Today. Beware, however, of other articles like the one in The Atlantic called ‘The Science of Near Death Experiences’. This 2015 popularization, written in the typical breezy style of newspaper reporters, also purported to summarize what we know about this condition. Sadly, the reporter spent most of the article interviewing those who experienced it and hardly any column space on actual scientific research. It was a typical ‘puff piece’ that offered nothing more than speculation and very self-serving and bias-affirming pseudoscience, along-side free plugs for many recent, lurid, books and movies about first-person accounts. The bottom line is that NDEs are by no means common to people who think they are dying, and their incidence crosses many religious boundaries. They remain enormously powerful events that actually change the lives and even personalities of the survivors, and so they are not merely will-o-the-whisp hallucinations. We do know that their detailed descriptions follow specific cultural expectations for what the afterlife is like: a New Guinee tribesman will not describe the event the same way as a southern Evangelical. We are only beginning to understand how our brains synthesize what we experience into the on-going story that is our personal reality, but we know from the evidence of numerous brain pathologies that this is a highly plastic process in which imagination and emotion blend with hard facts in a sometimes inseparable tapestry. Our senses are objectively known to be fallible in countless ways if left unattended, and how we interpret what we experiences is as much a logical process as a process of out-right confabulation. Like many other events in our lives, NDEs are seen as one experience that our brains work very hard to incorporate into a plausible story of our world. It is this story that through millions of years of evolution allows us to function as an integrated Self, avoid being injured or eaten, and propagate our genes to the next generation. Isn’t it amazing that, against this backdrop of cognitive dissonance, sensory bias, emotional chaos, and evolutionary hard-wiring we can create a workable story of who we are in the first place? Check back here on Monday February 28 for my next blog! Previous PostDeath By VacuumNext PostMartian Swamp Gas? sir I’ve to tell you that probably I’ve an impossible idea to look into future. Suppose light from a star reaches the earth in one million years,(they travel with velocity of nearly 3×10∆8). Now let’s assume that the velocity of the light photons are doubled ,then they reach earth in half of one million years(now they are travelling at 2×3×10∆8). we know that photons carries information of everything it strikes or from where its produced,and we are able to detect the “present” of an object due to this fixed velocity of light(that’s 3×10∆8). suppose the same example here on earth .An object reflects or produces light at the real velocity.Then we ‘ll see the present of that thing,but when we double the velocity of that source or reflector,what’ll we see will be more than the present means the information will be reached to us in a time more than present,that is FUTURE. am I right or not,sir? Some of very sensitive peoples can detect of someone dying before 40 days of the nearby death day .The physical,psychological as well as social interaction of the dying person seems to change in the last 40 days of life .The dying one slowly isolates and shows no interest in the worldly things in these nearby death days. Am I right or wrong sir? Hi Syed. Thanks for your interesting and thoughtful comment. The problem is that light follows the laws of special relativity very exactly, and since Einstein developed this theory back in 1905, numerous tests have found that there is no way to work around the speed limit of light in a vacuum which is 299,792.5 km/sec. Nature seems to be very firm that it will not tolerate any work-arounds to make information travel faster than this speed limit. The only hypothetical particle that would do the trick is the so-called tachyon, but no evidence for such a particle has ever turned up, nor has any phenomenon in the non-quantum world shown that it operates at our scale or the cosmic scale. Syed, Thanks again for your comment! I also know that some dogs can be trained to detect cancer in people who do not know that they have it. I think you are absolutely right that the dying person tends to retreat into some inner world as the process advances. I witnessed this myself when my own parents passed away.